Wondershare’s PDFelement pro software is a simple yet efficient application to edit, convert, create and merge PDF documents on Windows and Mac along with iOS. It can also convert a group of PDF documents into the required format like Word, JPG, Excel, etc., executing in a batch process saving a lot of time. You can work like a pro when you edit PDF files just like a Word document along with protection, security and sharing features. A one stop solution in terms of fast executions and affordability for freelancers and small businesses. On a quick glance, we can easily navigate to the options that we need. The major features that this page portrays are options to edit an existing PDF document like add, cut, delete, edit and copy images, text and other objects; Converting a PDF document into our required document format such as Excel, Word, PowerPoint etc. ; Creating a new PDF document by converting from files in the like Microsoft Word, Images etc. 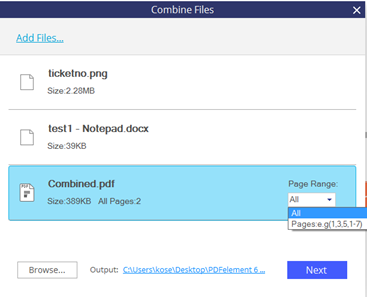 ; Combining a PDF by merging different PDF files or multiple file types. There is also an option to convert many different PDF files into the file types of our choice in a single go by using Batch Process which is a time-saving feature. There is access for lots of ready-to-use PDF templates and forms for quick processing. 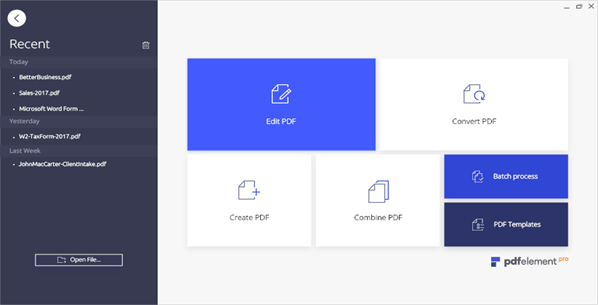 The tool bar on the main page contains options to create PDF file from any file type, create PDF file from scanner directly, there is a dedicated option to convert PDF file into Word file format and another option to convert PDF files into other file formats like Excel, Image, PowerPoint etc. PDF Merging is provided in the “Combine PDF” option where you can merge different file formats into a single PDF file which is its specialty. You can also drag-and-drop your files or add files to merge. The software provides an option for PDF files to selectively merge a single page or a page range from those PDF files to be merged into a single PDF file. The data is merged accurately and very quickly. The only drawback is that when you try to merge 2 or more files into one, the page numbers remain the same from the previous files. Though there is a solution for this from the customer support team which is that they would provide a program to run which removes the page numbers and from the software tabs you can assign page numbers accordingly then. It would be more hassle free if they embed the same while merging the files. PDFelement pro supports most of the input file format types like txt / html / png / jpg / rtf / pdf / doc / xls / docx / rtf / xlsx / jpeg / webarchive / bmp / gif to convert into PDF files. The software tool provides Page View Mode where you can view one page of the document at a time or arrange the pages in a continuous vertical column enabling scrolling or side by side. You can change the page layout of the pages, zoom in/out, view multi-tabs at the same time up to 15 documents. PDFelement pro works just like Word document to edit PDF files. Features like font attributes (size, style, alignment), page numbering, header & footer, hyperlink insertion and deletion, cut, copy, paste, edit, delete make you feel like you are using Microsoft Office Word. In addition to the above, you can add, edit and create your own digital signature on the PDF. OCR (Optical Character Recognition) feature is available in PDFelement Pro version. With the help of OCR technology, the scanned PDF can be converted into searchable and editable documents. In the trial version after opening a document in the edit mode, click on the OCR option and it will prompt for downloading the OCR library. Install the OCR library and use it. If the software is purchased, then an email with URL download and registration code will be provided. This software version supports over 20 languages from the OCR language list. With this feature, you can export data from scanned PDFs too. PDFelement pro version supports converting PDF files into normal output formats like Excel, Word, Image and PPT along with formats like HTML, Text, WPUB and RTF. Converting standard PDF files to PDF/A which is an ISO standard output format for long-term archiving is also supported in this software. This version can convert PDF from scanner directly with few clicks. It can convert most of the supported input file formats to PDF files and convert PDF files into majorly used output formats like Word, Excel, PPT, HTML etc. After conversion, the original layout is maintained with images, texts, fonts etc. PDF can be password protected from being opened by unauthorized users. Sensitive images and texts can be marked for redaction and more over such data can be searched and redacted making your work easier by its “Search & Redact” option. Users’ access can be restricted by applying permissions to PDF document to edit, copy, extract and print. 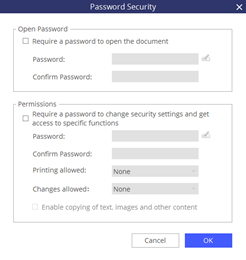 After setting the password and permissions for a PDF file in PDFelement pro, even though if you open that PDF file in Adobe, you are required to input the password to access the document. Moreover, one can custom watermark each page for authenticity and even digitally sign and approve documents. The edited/converted PDF file can directly be printed/emailed or can be saved to cloud storage such as Dropbox, Google Drive and can be sent as an email attachment. The price of a single license is $99.95 and for multiple licenses between 2-10 PCs savings of 6% apply and for more multiple licenses between 11-20 PCs, a saving of 10% applies. They also provide a volume licensing program for 20+ PCs with lots of other benefits where a quote can be requested. All major credit cards are accepted including PayPal and a wire transfer is also allowed for eligible business clients. A free trial version is provided for both personal and business users where there is a limitation to certain premium functionalities for personal users on the other hand full featured access is provided for 14 days for business users. A 30-day money back is guaranteed if you are not satisfied with the software performance. The users pay only once for the license and they will get the free upgrades without any hidden fee. The Help tab on the screen will take you to some dedicated options like Online Help, Community, and YouTube resources. The community forums, FAQs, Online help and user manuals solve your doubts if you have and they provide technical support by email where they give prompt responses within 12 hours if it is a weekday and 24 hours if it is a weekend. Most of their YouTube videos and community forum are effective means of information. They do not provide live chat facility. The confusing part here is the “Online Help” option routes you to an introduction page rather than the online help page where all the resources are present. PDFelement pro software runs on the major operating systems like Windows and Mac including iOS supported devices. For Windows users, it works on Windows XP/Vista/7/8/8.1/10 versions. For MAC users, it works on Mac OS 10.12/10.11/10.10 versions. It also provides a portable version for iOS devices for iOS 8.0 or later versions so you can download the application from the iOS device App Store and edit/convert/export/share PDF files on the go. For version updates, product license and for paid features activation, Internet connection is required.